Winners of the Glenn County RCD Speak Off Content in 2014. 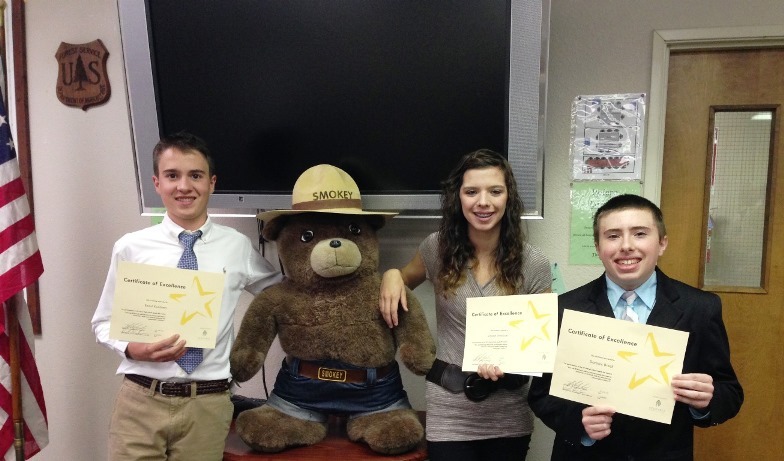 2nd Reed Koehnen, Hamilton High; 3rd Allison Wallace, Orland High; 1st Dominic Brock, William Finch Charter. The California Association of Resource Conservation Districts (CARCD) Education Committee makes information available to Resource Conservation Districts (RCDs) that wish to enhance their education and outreach to K-12 students who are interested in natural resource management and agricultural issues. The annual National Association of Conservation Districts (NACD) and NACD Auxiliary Poster Contest provides students from kindergarten through 12th grade the chance to have their art displayed as part of a national conservation outreach initiative. Each year, the winning posters reflect NACD’s annual Stewardship theme, and highlight the work of conservation districts and their state conservation associations, auxiliaries and agencies to protect and enhance natural resources. The contest starts at the district level; winners advance to the state level, and then to the national level, where they receive recognition at NACD’s annual meeting. The poster contest is open to public, private, and home-schooled students. The top three posters in each category of the national contest will receive monetary prizes. First place winners will receive $200; second place winners will receive $150; and third place winners will receive $100. The NACD Auxiliary, through their quilt project proceeds and the Albert I. Pierce Foundation, sponsor prizes at the national level. How can RCDs help landowners reduce the threat of fires? The CARCD Conservation Education Speak-Off is an annual competition designed to help California high school students learn about natural resource issues in their area, build public speaking skills and confidence, and enable conservation practitioners to hear from youth about issues that matter most to them. With the support of their local RCDs, students compete first at a county level and then regionally for a chance to participate in the final speak-off round at the Annual CARCD Conference in November. Winners and runners-up receive cash awards for their time and effort. Travel to and from these events for the student and chaperone is paid for by their RCD.